I know that somewhere out there lots of runners feel like I sometimes do; they might be embarrassed about depression or they might feel that no one wants to hear about their problems. Even if you’re not depressed, maybe you just don’t have many people who share your interest in running. Maybe you just want someone to be there, to spend some time together and share a nice long run. I’m here to tell you that there are lots of people out there who understand and who relate to you, and they’ll pace you as long as you want. You just have to find them. When my sister approached me with the idea of Salty Running I imagined women reading it and finding a comfortable place where they could talk about any part of running, the good stuff and the bad. I want them to know it’s okay to let out their feelings and opinions in healthy ways, and that they have someone at Salty who will listen and not pass judgement and who shares their passion for running. That’s what’s so great about Salty: It’s not just a blog, it’s a community! There are lots of other ways you can expand your running community, which can help you become faster, encourage you toward your goals and best of all, make new friends. Here are a few tried-and-true methods to find some new running buddies. 1) Become a lurker at your Local Running Store. Almost every LRS has a community of runners around it who support its business, including the staff. If you have a LRS in your area (and you probably do), visit regularly even if you don’t need to shop. You can stop in to ask what races are going on, look into their running team if they have one, ask for advice, talk about new shoes, debate the merits of GPS vs. stopwatch… Pretty soon you’ll be friendly with them and they’ll tip you off to all the good races and events. Without chatting with the awesome staff at JackRabbit Sports I would never have found out that Scott Jurek is coming to town on his book tour and leading a little run through Central Park! 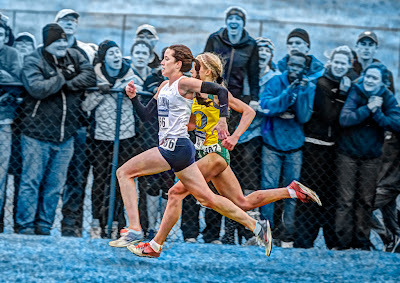 You better believe this sprint to the finish deserves a high five and a "good job." 2) Talk to other runners at races. If you try chatting people up in race corrals and come up short, don’t sweat it. Usually before and during the race people are trying to focus, so try chatting afterward. A good tactic is to find someone who ran at about your same pace throughout the race. Especially if you passed each other a lot or if you raced each other to the chute, find her after the race and congratulate her. Strike up a conversation and you might even find a new training buddy. Members of the North Brooklyn Runners volunteering together. 3) Join a running club. Better yet, if you have multiple clubs in your area join them all. 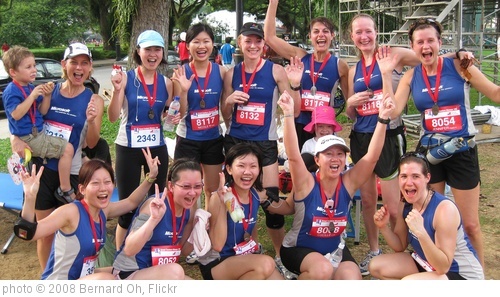 Most clubs have group runs in which anyone can participate, and they almost always welcome new or prospective members. There are lots of clubs in New York so I shopped around for quite a while before finding a club that was right for me. When I finally did it was like coming home! 4) Volunteer Volunteer Volunteer! Volunteering is a great way to meet other people interested in running! We all know that volunteers are the backbone of the running community since most races couldn’t get done without them, so give a little of your time and make sure to chat up the other volunteers. If you meet someone you like talking to, see if she wants to join you for an easy run after the race, or make plans to volunteer together again. A HHH Red Dress Run. Nope, these people aren't running for charity, they're running for beer. 5) Try the Hash House Harriers. The quintessential “drinking club with a running problem” is a great place to socialize and meet new people, since their runs generally finish with a social gathering that includes silly songs and lots of beer. The best part is that there’s a hash almost everywhere in the world – you can find a kennel near you here. A few word of advice though, hashing is not for people who don’t like singing silly songs. Hashing is also not for people who don’t like drinking, running through wild terrain, climbing fences, or general debauchery. Bring extra shoes and a change of clothes. Bonus: Start blogging! There are about eight-hundred and fifty-jillion running blogs out there; why not add your own to the mix? You can start here by telling us about yourself and what makes you great. Before I sign off, I just want to say thanks to my community. The flood of caring and supportive responses I received after my last post was simply amazing. Thank you so much to everyone who reached out to me! I am overwhelmed by you all! Especially though, I want to say a big big thank you to everyone from my running club. Joining you has increased the quality of my life drastically; it has given me a wide network of friends–all vastly different–who I might never have known otherwise. It has given me friends who live in my neighborhood, friends who like to run with me, friends who share my dream of ultrarunning, friends who like to race, friends who run slow, friends who run fast, but best of all it has given me friends who will patiently put a hand on my shoulder and remind me that I will never be alone! How do you connect with other runners?